It may have become a WineInk cliché, but over the past decade, this column has made reference to the Rolling Stones’ song reflected in the title. That is because each year at this time, that would be each harvest season, I think about those who toil to get the grapes off of the vines. Those who rise before dawn and head into the vineyards to pick the fruit at the precise moment when it will make the best wine for our enjoyment. Once each bin was filled with 35 to 50 pounds of grape clusters, the men lifted them high on their shoulders and dumped them into the trailer that followed the tractor. As the first group made their deposit, the second group of two scurried ahead and began to cut more clusters. It was clear that there was order and strategy to the process. As I tried to keep up, I kept stumbling on the residue of vines that had fallen in my path. I did not cut myself with my cleaver but it was only because I moved so slowly to make sure that I would not do so. By the time I cut the clusters from the first vines the team had already moved to the next row, laughing and speaking (I am sure about me) in Spanish. With a row completed, I raced to the tractor only to drop about a third of my bin on the ground. More laughter ensued. By the end of about three rows, my hands and back were so sore that I was both hobbled and humbled. The point is, this is what it takes to hand pick grapes for premium wines: a lot of precise, elegant and hard work. 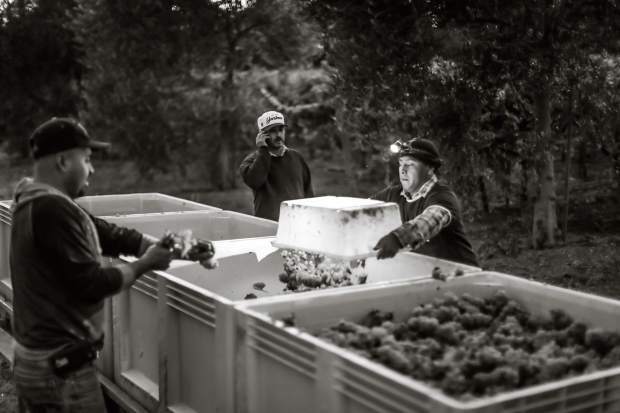 It is as much a skill as that possessed by any farm worker and one that is greatly admired by those winemakers who employ the teams of men who make the harvest happen. So it is that each year I try to write a column that pays homage to these oft-forgotten workers who are literally the backbone of the wine industry. They don’t make the wine, but without them there would be no wine made.